Occlusion volumes are not working it seems. I got this game from the Humble Bundle, does that still mean I am able to get the update? Thanks for this awesome update (and all other updates in the past)! Italy runs really well on my computer! Nice update. New car and map are fantastic! Nah, it happens on all bodies of water in the game, as you can see here (harder due to a being a screenshot, but look in bottom left) on the cliff level, at least the devs are looking into it who are, no offence to you, much more likely to know the cause and solution to this, and regardless, I'm still having tonnes of fun with the new update! Haha all is good then, just have to be careful with people on the Internet haha! So far I found one issue: There's a dock at whoever knows what this place is called with bollards, pretty sure you guys took a teaser picture of Italy there. If you use the Piccolina and back up into them, they start eating up your vehicle lol - Haven't tried this with other vehicles or other parts of the car though, only back. Awesome update. One thing I noticed is that there is another letter on my front plate than the rear plate on my Piccolina. Edit: full screen no longer works. The second I press alt+enter, it flashes to full screen and instantly goes back to windowed. It worked earlier today, the only thing I did was install one new mod and removed the old, conflicting ones. Even after clearing cache and going into safe mode it won't work. Great update and great cars. Thank you! Pressing the in-game full screen button is even weirder. I'm probably going to do a clean install now. On some rare case it could happen. We still have to pinpoint the exact cause. Thanks devs, my haven't you been busy! This will be my best Christmas present by far. Your hard work and passion for the game is really appreciated! What to say? Just perfection. Using the Script AI causes severe lag after you stop recording. Is there any way to remove the guardrails on Italy without removing most of the map? Can get videos on all of this if needed. Very much enjoying the update, especially the new map! One thing I have noticed is that rotations of models seem to be a bit laggy since the update. For example, in the attached clip, the game is running at about 400 FPS (as seen in the top right corner), (the capture I believe runs at 144FPS) but the model itself is lagging between rotations. The clip isn't the best to explain so I'll give a description. I was working on something that was rotating and before the update there were no issues with any choppy rotations. After the update, the model looked like it was skipping rotations and so appears choppy (ie. it seems to be updating less per rotation cycle - if that make sense). I am using the onPreRender() function to rotate the model though I didn't see anything about this function being changed in anyway, so it's strange that this is suddenly happening. I tested to see if the function is averaging the same number of updates per second and it appears to though I cannot guarantee since I didn't test before the update. 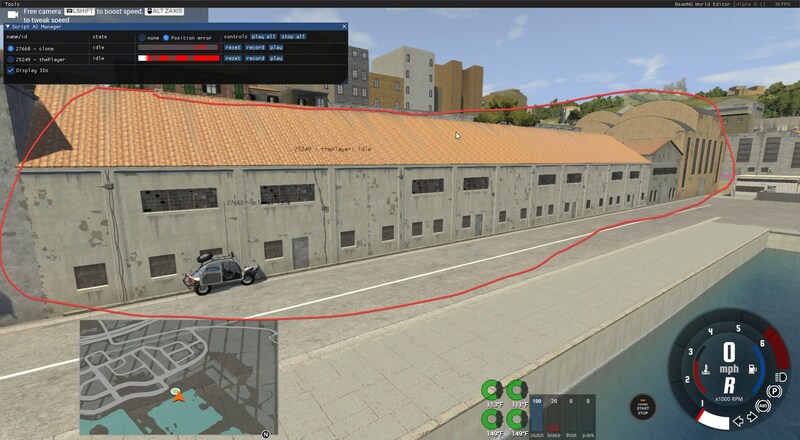 This entire row of buildings do not have collision on them except the the last on the on the left behind the car. Thanks, we need some testcase for that if possible via PM? Thanks!